Streamlined rules-based clash detection, reporting and COBie functionality. AWW Inspired Environments delivers architecture, masterplanning and interior design across all sectors worldwide from their UK based offices in Bristol, London and Plymouth. This year, AWW was for the first time featured in the fourth annual London Stock Exchange Group report which highlights “1000 Companies to Inspire Britain” – the report celebrated the fastest growing and most dynamic small and medium sized enterprises in the UK. AWW has had the foresight, vision and strategic agility to adopt digital innovation and working practises, and their Practice has been at the forefront of pioneering and utilising the 3D BIM design realm since 2008, resulting in their office building at 66 Queen Square in Bristol being awarded the BIM Project Application of the Year in 2014; two years before the UK Government BIM Mandate of 2016. AWW’s capability and competency in adopting and embedding BIM practises and processes has been further demonstrated with the award of BRE Global BIM Level 2 Business Systems Accreditation across all three offices, making AWW one of only a handful of exemplary BRE globally recognised BIM Level 2 proficient companies. Matthew Knott is AWW’s National BIM Manager; his previous experience in building services project management, computer games, property development and the successful completion of an MSc BIM provided Matt with the knowledge and competency to achieve BRE Global BIM Certificated Practitioner status and join AWW in a role that sees him assisting the business with management, implementation and best practise of BIM processes at both an internal organisational and project level to help the business drive forward. HOW WOULD YOU DESCRIBE THE WORK THAT YOU AND YOUR TEAM DO? AWW has eight BIM champions spread across the Practice whose role is to carry forward and support BIM processes and best practises on internal and external projects throughout the business and capitalise on the efficiencies of BIM and innovation through the use of digital tools such as Solibri. 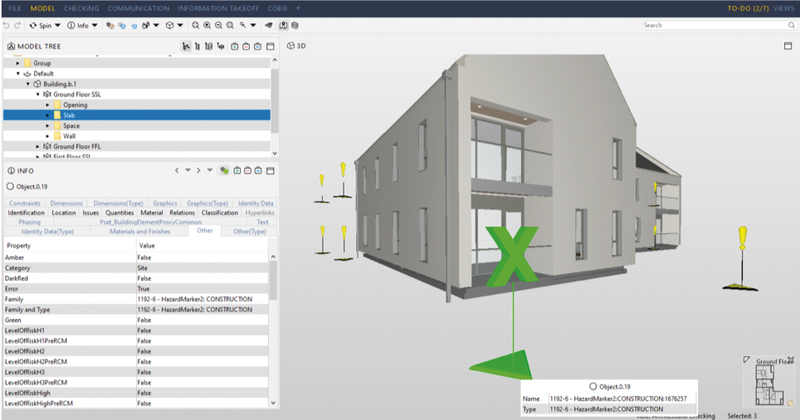 HOW DO YOU CURRENTLY USE SOLIBRI MODEL CHECKER & VIEWER? Currently AWW uses Solibri for design checking (spaces and sectioning), data validation and coordination checks with other disciplines’ models where required. A key function AWW has been very keen to develop with Harry O’Neill and the Solibri UK team is one that allows us to check and validate that our models are compatible with PAS 1192-6:2018 (Specification for collaborative sharing and use of structured Health and Safety information using BIM), visually conveying the health and safety CDM regulations by bringing the risk register in to the 3D design. The Solibri Model checker is AWW’s validation tool of choice, which, when used with Solibri Model Viewer, enables AWW clients, and project stakeholders to interrogate the safety, and see and contextualise the information. The Viewer not only allows any member of AWW staff to quickly and easily open and interrogate an IFC file without needing access to CAD or a very high spec PC, but it also gives us a reliable and FREE tool that AWW can recommend to clients and project stakeholders collaborating with AWW on projects who may want to view our models. This is now particularly relevant to Solibri Viewer with the release of PAS 1192-6:2018 which, in order to be compliant states information, shall be “transferred to asset owners, operators and users via a consistent integrated digital open standard format”. WHAT FUNCTIONALITY ARE YOU NOT CURRENTLY USING? DO YOU HAVE ANY FURTHER PLANS FOR SOLIBRI MODEL CHECKER AT AWW? Along with consolidating current AWW BIM project data validation methodologies, our main focus will be to expand and integrate Solibri Model Checker validation and quality assurance functionality relating to PAS 1192-6:2018, to enrich AWW models, deliverables and information particulars with the correct data, appropriate context, and compliance to project stakeholders. As the business benefits of UK BIM Level 2 process is further embedded in construction, AWW believe Solibri has a very strong place in the industry digital toolset for IFC model collaboration, federation, data validation and integration. AWW intends to extend the adoption Solibri Model Checker beyond our current use and customise configurations to become the dominant tool for model checking, validation, and quality assurance across all AWW projects. HOW DO YOU SEE THE FUTURE IN TERMS OF HOW SOFTWARE, BIM AND IFC ARE CONCERNED? Last year’s BuildingSMART UK merge with the UK BIM Alliance and the recent release of PAS1192-6:2018 specification for collaborative sharing and use of structured Health and Safety information using BIM, bolstered the propensity of using IFC as a collaborative format. Specifically, Clause 9 – COBie, Clause 10 – ISO 16739 (IFC) and Page 36. Clause 7.1, Note 4.3 (Information is) non-proprietary in that all entries should be viewable and editable using open formats without any licensed application. Irrespective of where and from whom IFC files originate, Solibri and its additional free viewer can be considered a valuable software solution for AWW project and client integration, interaction and subsequent asset owners or operators.